An unstoppable slap shot from Maxim Noreau and a shut-out shared by Ben Scrivens and Kevin Poulin saw Canada edge past Finland in a tense quarter-final game. 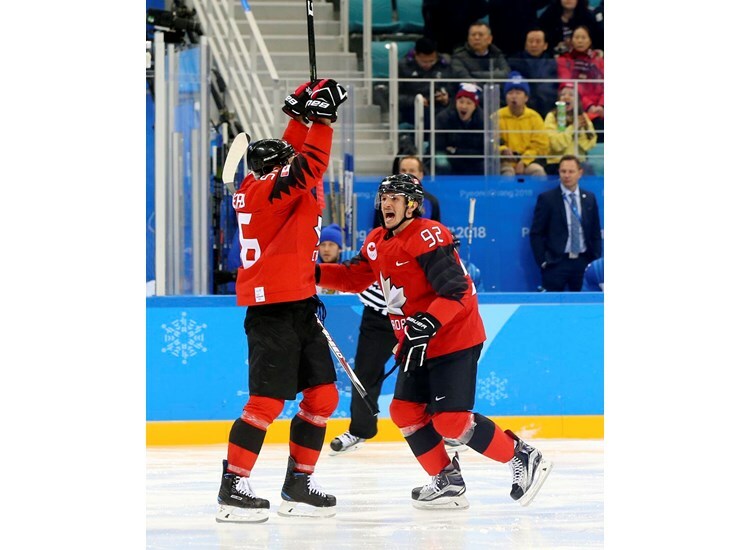 Canada's dreams of a third successive Olympic gold are still alive after a narrow victory over Finland. For the Nordic nation, though, defeat in this quarter-final match-up means there's no chance to improve on its Sochi bronze. For these teams, it was the biggest meeting since the 2016 World Championship Final in Moscow. On that occasion, Canada claimed a 2-0 verdict inspired by Connor McDavid in a performance that announced the youngster on the world stage. Tonight offered the chance for Eeli Tolvanen to do likewise. In a clash of two teams relying on solid defence, his pace and flair had the potential to forge the breakthrough for the Finns. Indeed, in a first period that produced few incidents of note, Tolvanen provided one moment of excitement when he got away from Marc-Andre Gragnani with a scintillating burst of speed down the right. However, he ran out of space to get his shot away and Ben Scrivens was able to smother the chance. It was the brightest moment the 18-year-old Jokerit Helsinki prospect could produce all night. The Canadian defence was at its smothering best, chances were hard to come by. In the end, though, it was a very different player – and a very different play – that decided a hard-fought battle between two teams with genuine medal ambitions. Noreau, a 30-year-old defenceman who has spent the bulk of his career in Switzerland after making a handful of NHL appearances, smashed home the winning goal of the game early in the third period. If Tolvanen’s game promises rapier-like thrusts, Noreau’s is built around the power of the blunt implement. He’d already tested his slap shot against Switzerland, and tonight he unleashed it again in fine style to smash an Eric O’Dell feed past Mikko Koskinen. O'Dell, who won the face-off to set up the vital goal, was full of praise for his colleague. "Playing with Max is just awesome," he said. "He's a hard-nosed guy, we kinda read off each other, we've got some good chemistry, same as Klinker [Rob Klinkhammer] and I think we'e been really effective in the last couple of games and coach likes putting us out there. It's fun playing with the guys. "Max just plays confident out there, he knows what to say on and off the ice to spark the boys. It definitely really helps us." Noreau’s defensive contribution was also huge as Canada battled from start to finish to stifle the Finns. At times, it made for a difficult game to watch. The first period was almost bereft of goalmouth action save for that Tolvanen rush and a couple of misjudged glove saves. First, Scrivens failed to hold on to an effort from Jarno Koskiranta, forcing Mat Robinson to make the clearance. Then, right at the end of the period, Mikko Koskinen fumbled a Chay Genoway effort. In fairness to the goalies, there were so few shots on either net that it would have been hard to maintain concentration. Canada began the second period in more aggressive fashion, but it was Scrivens who faced the first real emergency. The Canadian goalie took a pounding when O’Dell’s check sent Veli-Matti Savinainen crashing into him. By the time everyone had disentangled from the net, and each other, Scrivens needed a moment to gather himself before continuing with the game. However, after making one more save, the Salavat Yulaev Ufa man went to the bench, replaced by Kevin Poulin. The two goalies combined to turn away 21 Finnish attempts and bring home the W. Like O'Dell said, hard-nosed. "When you see guys going down, getting crazy blocks on shots, it gets the whole bench up," the HC Sochi forward said. "That's just the Canada way, that's how we play. We're a hard-nosed team and when it comes down to it we're going to do anything we can to get the win and it paid off tonight." Finnish forward Oskar Osala endured a frustrating evening. "Our game plan was the same as it always is: play active, forecheck hard, get turnovers and create chances off those," he said. "I thought we did that well. Especially in the second period we had some great chances and if we could have buried one of those it would have been a different story." Poulin’s first meaningful action was to block an angled Petri Kontiola shot, but Koskinen was the still the busier of the goalies. Even so, Finland’s defence was adept at keeping the Canadians on the outside, and apart from one link-up between Derek Roy and Rene Bourque there was relatively little beyond the routine for the SKA St. Petersburg netminder to contend with as Canada kept getting bodies on the line and blocking the puck at every turn. Once Noreau broke the deadlock, Finland needed to raise its attacking game in the final frame. But too often its raids crashed on a red wall of Canadian defence, with Poulin well-protected by his team. Even Finland's final surge, withdrawing Koskinen with 90 seconds to play, could not find a crack in the armour as Canada moved into the last four once again.